As fitness movements go, few have been as explosive as the boutique studio concept. One reason is that studios accommodate a range of fitness programming that capitalizes on red-hot lifestyle trends. With programs like yoga, Pilates, cross training, stationary cycling, heart-rate, boot camp, and HIIT, a studio can concentrate on individual instruction and small-group training that allows for more customization and social support, while promising quicker results. According to the 2017 IHRSA Health Club Consumer Report, membership in boutique studios climbed 15% from 2015 to 2017, while multipurpose, fitness-only, and corporate/business clubs suffered a decline of 3% during the same time period. Helping fuel this increase is that boutiques attract a younger demographic, with an average age of 30 years old—10 years younger than those who use more traditional clubs. Some of the most recent success stories in the fitness industry have occurred in the studio segment. Bold-face names like Orangetheory and SoulCycle have enjoyed significant growth in multiple markets. This has inspired larger, multipurpose gyms to create a studio environment within their clubs, many with great results. So that’s it. Case closed. Open a studio and rake in the cash, right? “Eighty-one percent of studios close or fail in the first year,” says Ashley Selman, owner of Evolution Trainers in Mountain View, CA. Selman recently conducted an IHRSA webinar, “Make Your Studio Stand Out from the Crowd,” where she shared the lessons she learned while creating a successful boutique club in a hyper-competitive environment. A former track-and-field athlete, Selman comes from a fitness background and worked as a personal trainer in the Mountain View area for years. When she decided to open her own place, she quickly realized that she lacked basic business training to make her studio concept work. From the very beginning of making your studio concept a reality, you have to work through a number of critical decisions that affect your bottom line. Consider your basic location costs. Some of the most recent success stories in the fitness industry have occurred in the studio segment. Selman took some basic business and accounting classes, which she recommends for any budding fitness entrepreneur. She also suggests that you focus on three areas when building out your boutique concept. Vision. Know exactly what type of studio you are marketing to the public. Your identity must be clear to you if you want it to be clear to consumers. Business model. Ask yourself these questions: What are your primary revenue streams? What equipment do you need to start with? Are you leasing or buying? Are your employees going to be contractors or on staff? Financial reports. Do you have a system to track your billings and costs? What is the source of your startup funds? There is no single correct answer to any of these questions. Every situation is different. For instance, when it comes to start-up funds, Selman says you can go the traditional route with bank loans, personal loans, or self-funding. She raised money with “client pre-sales” from the pool of long-time customers who she worked with in Mountain View over the years. You have to be flexible and sometimes creative. Selman says you should have a “break-even analysis” by six months—and that includes paying yourself. You need to give yourself at least that much time. With a studio failure rate of 81%, the deck can seem like it’s stacked against you. Even those who opt to go the franchising route can find themselves overwhelmed by financial commitments. Business is business, and even a proven concept can go off the rails if you’re not prepared. You can greatly increase your odds for success if you have an experienced technology partner to help. Dana Milkie, president and CEO of InTouch Technology, has worked with many owners of boutique studios who initially struggled to attract new members. “Unfortunately, there's this misperception when you buy into a boutique concept that prospects will just show up at your door and your studio will end up being packed with members,” says Milkie. “While you’ll initially attract some people because you’re the new kid on the block, at some point you have to do the hard work of getting your name out there, bring prospects in the door and converting them from a lead to a member in order to sustain your success. " 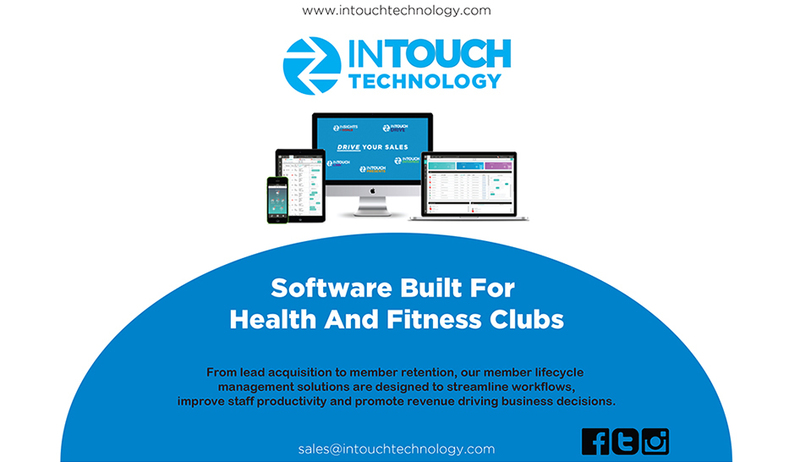 InTouch partners with fitness facilities of all sizes by developing software that focuses on four areas: prospect acquisition, lead conversion, member retention, and reporting. Their latest innovation is Drive, a powerful CRM technology that’s designed to increase sales conversion rates and improve member retention. Drive targets 7-11 points of contact to leads and members, including phone calls, custom email and text messages. The software also delivers automatic drip communications to keep the momentum going, insure revenue growth, and long-term success. The InSights reporting dashboard is intuitive and responsive, providing real-time reports to help you manage your sales efforts. With SmartGoals and other built-in features, Drive gives your staff a daily actionable plan to help meet your target numbers. Many studio owners know how to provide a tremendous fitness experience. But that’s hardly enough. A data-driven technology partner who works closely with you can make all the difference. InTouch specializes in being the business partner you need. Learn how to maximize club revenue by leveraging the growth of the studio segment. Your Health Club Members Have Gone Digital. Why Hasn’t Your Marketing Strategy? Bryan O’Rourke, president of the Fitness Industry Technology Council, details three basic steps to any successful health club marketing strategy.